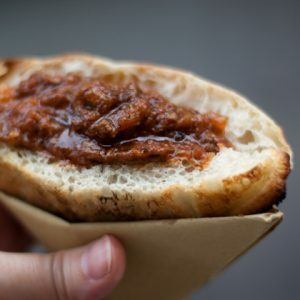 When it comes to Roman food, there is one place I like to go first — the blog of Rachel Roddy, Rachel Eats. Her book, Five Quarters, is coming out any day now and I’m pretty sure its going to be a firm favourite that doesn’t even make it to the bookshelf, it’ll just sit permanently on the kitchen counter next to my other most well-used cookbooks. We had a little chat about maritozzi, these delightfully sticky, sweet Roman buns, recently when I needed to find out a little more about them for this blog post on them for Food52. I’d read that maritozzi were the favourite breakfast of the Romans, particularly in the 1950s and 60s, before the ubiquitous cornetti (Italian croissants) took over counter tops. 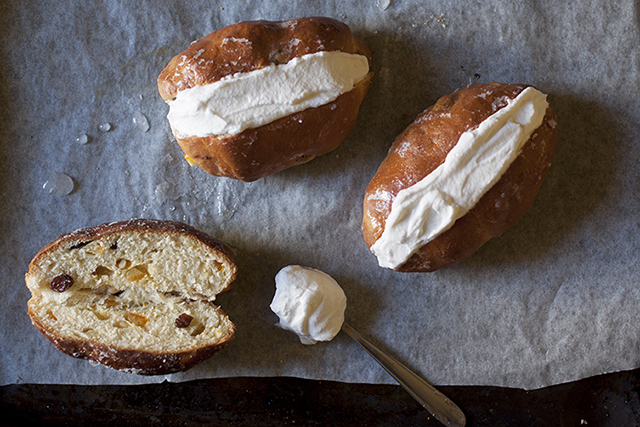 Today, though, it’s more and more rare to find these raisin-studded buns (sometimes with pine nuts and candied orange peel too), filled with whipped cream in Roman bars. I’d seen them in Testaccio, no doubt at the same local bar that Rachel visits in her Roman quarter. It’s one of the few places in Rome that still make this nostalgia-inducing treat. And then there’s Rome’s well-known pastry shop Regoli, which makes possibly the biggest, most indulgent maritozzi ever, well-documented here at Dan Etherington’s blog, Bread, Cakes and Ale. Why such a delicious and charming thing is in extinction is beyond me, but luckily they are also surprisingly easy to make at home. Although today’s maritozzi are usually studded with just raisins, many traditional recipes, such as the one from Roman cookery queen, Ada Boni (author of 1929 Il Talismano della Felicità, known as The Talisman, in English), include also pine nuts and candied orange peel. 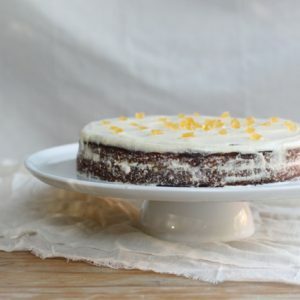 If you don’t like candied fruit, try this recipe with lemon or orange zest (or both) for that citrus aroma. 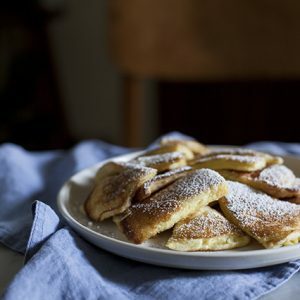 You could also skip the glossy syrup top if you are feeling lazy and simply dust with confectioner’s sugar before serving, as suggested here in Dan’s excellent recipe for maritozzi (also very useful for seeing how to shape these buns). But I love the syrupy top. This recipe is inspired partly by Ada Boni’s maritozzi recipe in Il Talismano della Felicita (1929) and partly by Carol Field’s recipe in The Italian Baker (1985), one of my favourite books on Italian breads and other baked goods. Neither specify the use of whipped cream in the buns, but it is the way you popularly find them in Roman cafes and it is indeed a very good idea. You can see the cups/ounces conversions of this recipe from my Regional Italian Food column on Food52. Many Italian recipes specify baking for a very short period – 6 or 7 minutes at most – in a very hot oven so that the buns retain their softness. But I have found it a bit more reliable to bake in a moderate oven for 15-18 minutes (especially if you have a temperamental oven). Dissolve the yeast in about ¼ cup water in a wide bowl and set aside 10 minutes. Add a quarter of the flour (50 grams) and combine to create a smooth paste – this is the yeast starter or sponge. 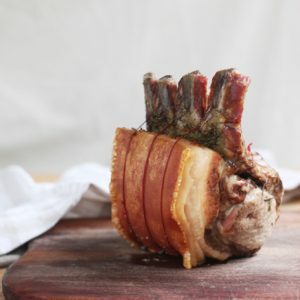 Cover with a tea towel and let rest 15-20 minutes in a warm spot where it should create plenty of bubbles. Place the rest of the flour into a large, wide bowl (Italians like to make their dough on a flat, clean surface like a board, forming the flour into a sort of pyramid). Make a well in the centre of the flour and pour into it the yeast starter, egg, sugar, butter and pinch of salt. By hand, combine the ingredients by whisking with a fork from the centre outwards, incorporating the flour bit by bit. You want a manageable but soft dough that’s not too sticky or too dry (I read many accounts that said they needed to add more water to Ada Boni’s recipe; I needed to add more flour). 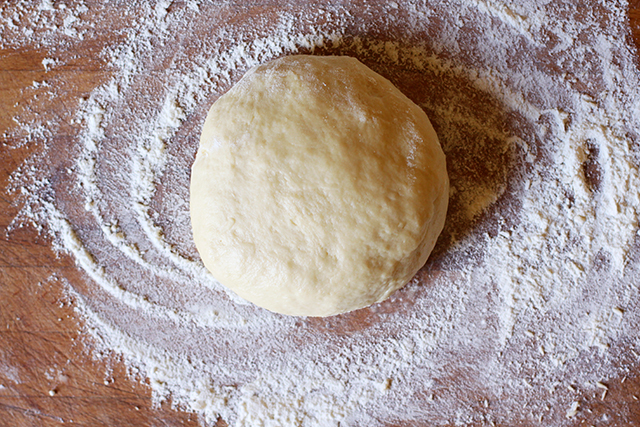 Turn onto a well-floured surface and knead you have a very smooth, soft elastic ball of dough, about 8 minutes. You can also use a mixer for this procedure. Place the ball in an oiled bowl and cover with a tea towel. Let rise/rest in a warm place for about 1 hour or until doubled in size. Carefully turn the ball onto a floured surface, flatten the ball into a rectangle and add the raisins, pine nuts, zest and candied fruit, if using, to the dough and roll the dough from the short end. Flatten again and roll from another side. The raisins should be somewhat evenly distributed. Now divide the dough into about 8 even balls (weigh them if you want to be precise and have them come out all the same size, roughly 2.5-2.8 ounces or 75-80 grams each) and, rolling them into small oval shapes, place them one by one onto a baking sheet layered with baking paper, leaving plenty of room between each bun. 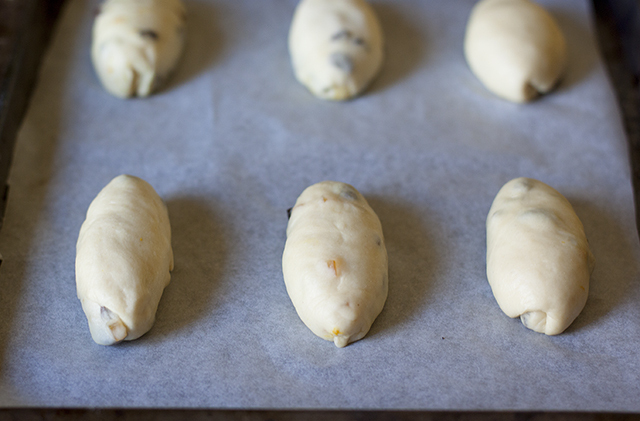 Let them rise for 30 minutes in a warm spot away from drafts, covered with a tea towel. When ready to bake, preheat the oven to 350ºF (180ºC) and cook for 10-15 minutes or until puffed and just golden on top and bottom. They should remain soft and fluffy inside. While they are baking, you can make a quick syrup by boiling 2 tablespoons of sugar in 2 tablespoons of water until dissolved. Brush this syrup onto the hot buns and let the syrup dry and the buns cool completely before splitting open and filling with freshly whipped cream. Note: You can double this recipe, but double all the ingredients except the yeast, i.e. 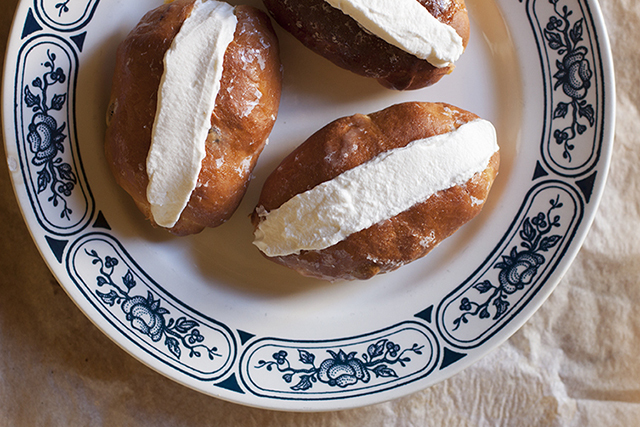 you only need 25 grams of fresh yeast to make 16 of these buns. If you are using more than one tray to cook these, I recommend baking only one tray at a time and placing it in the middle of the oven. What an exquisite treat! I can’t wait to try those buns. Thanks Rosa – they’re a delight! I think a lot of people are taken aback by the suggestion they should kneed something by hand for 8 minutes and just skip to the mixer, but its a great opportunity to make yourself learn the ideal texture and consistency. Looks like a great way to use up my 2 lb bag of yeast I got a couple weeks ago! I myself don’t have the luxury of a mixer (my only kitchen appliance is a stick blender!) so I am always doing things like this by hand — and you’re right, it’s the perfect way to get to know how dough is meant to behave. I, too, suspect it was because people suddenly felt guilty about what they were eating and wanted to watch their waistlines (but how glamorous did everyone look in the 50s and 60s? I’d say even better than now!). I had no idea they did them in Sesto, will be sure to look out for it when I pass through next! Hi Emiko! Thank you so much for this recipe!! I just made it (it’s sitting on my countertop now) AND IT TASTE LIKE A FREAKING DREAM!! I’m not much of a bread person but I think I can finish all of them in one sitting! This bun is so darn good and amazing and citrusy the only regret I have is not making more. But I have 2 questions though, I’m using dry yeast, so if I wanna double the recipe should I double the amount of yeast? Also are these bun kinda like brioche bun (as in the ratio of eggs flour and butter etc)? Thank you! So happy you like these as much as I do! You can use less yeast (double the rest of the ingredients) and leave the bread to rise longer and more slowly, in the fridge overnight, for a better bread – more fragrant and flavoursome. If you’re in a hurry though, you can also double the yeast along with the other ingredients and have it rise just an hour. It still works, if a bit more yeasty. I prefer the slower rise. You shouldn’t have a problem with the second tray (consider: bake the first tray of rolls that you shape first), also because they bake so quickly. Good luck! Oh and if I bake one tray at a time, will the second tray of buns over rise and become tough? thank you!